Harlingen School of Health Professions students are making a name for themselves in HOSA Future Health Professionals. Seniors Aaron Castillo and Matthew Garcia were elected as officers and will be representing the student organization during the 2018-2019 school year. 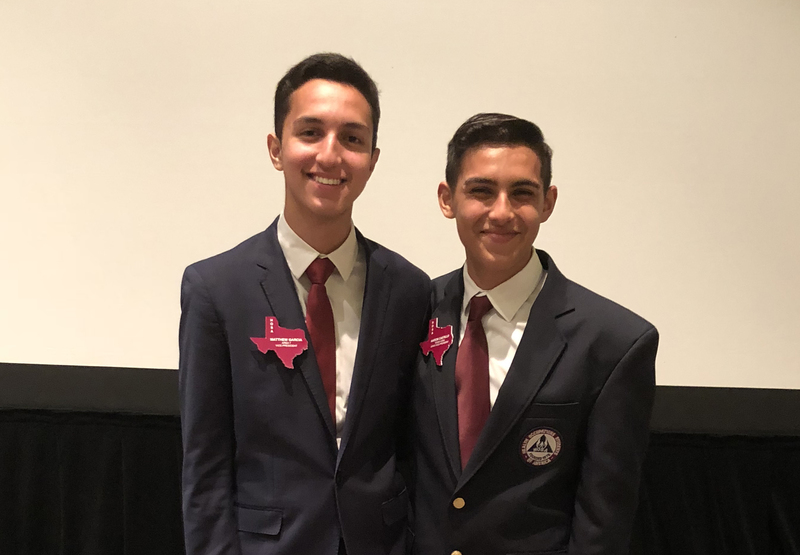 In February, Garcia was elected to serve as the Texas HOSA Area 7 Vice President after a round of tests, interviews, and speeches at the Area contest and Castillo, was endorsed as a state officer candidate. At the 2018 State Leadership Conference held in April, Castillo was elected to serve as the Texas HOSA State Secondary Vice-President. The Health Occupations Students of America (HOSA) is a career and technology student organization that provides a unique program of leadership development, motivation, and recognition to attract career-minded, qualified students to healthcare professions. HOSA, TA (Texas Association) is a state charter of National HOSA, consisting of local chapters and members who are currently enrolled in or associated with Health Science Technology Education Programs as conducted by or in secondary and post-secondary/collegiate schools of Texas, or interested in pursuing a career in a medical profession. HOSA students develop essential knowledge and skills that prepare them to explore and pursue a career in healthcare.